The 796 Digital Sports Watch has an easy to read, digital display with a stainless steel back and keeps track of time with unrivaled precision. This timepiece has a backlight feature that's brighter than other brands so you can read the time in any lighting conditions. This Digital Watch features a time and date display with an alarm and standard or military time settings. The 796 Digital Sports Watch has an easy to read, digital display with a stainless steel back and keeps track of time with unrivaled precision. This timepiece has a backlight feature that&apos;s brighter than other brands so you can read the time in any lighting conditions. 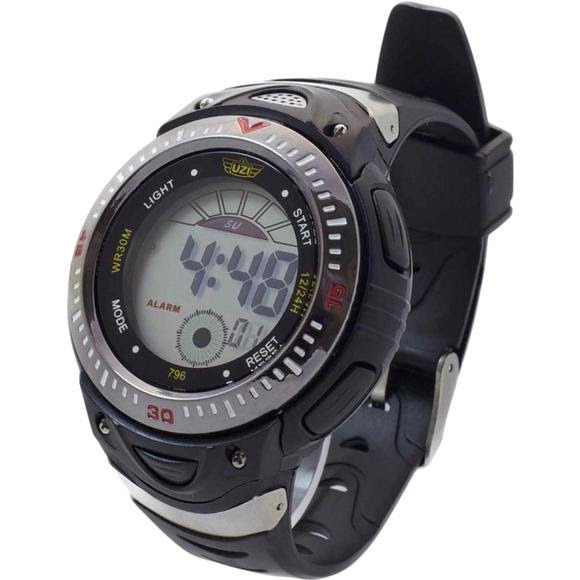 This Digital Watch features a time and date display with an alarm and standard or military time settings. This timepiece is an absolute must in the emergency, safety and protection sectors as well as in the armed forces but it&apos;s also ideal for adventure sports.